It reinforces the claim I have been making for ages that the real problem is not in Luxenberg’s interpretation of this or that term, so that a clever selection from his book would enable us to arrive at an all-correct set of Luxenberg’s Qur’anic interpretations. Instead, the real problem lies in his fundamental hypothesis and at the very root of his stance. Consequently, this false start renders erroneous even those secondary conclusions of his, which otherwise stand in harmony with the researches of the mainstream Qur’anic scholars. In other words, his entire book is an erroneous outcome of a false hypothesis. “Quite apart from the wayward philology and exegetical caprice exemplified above [see pp. 378, 379], the book makes no attempt to place its findings in any plausible historical context. 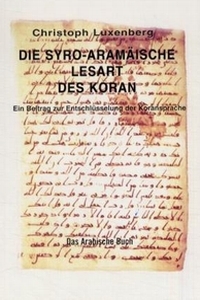 Who were the Christian inhabitants of the pre-Islamic Mecca who used the alleged Qur’anic “aramaisch-arabische Mischsprache” [i.e., Aramaic-Arabic mixed language], and what exactly were their Syriac writings which are supposed to have produced the Arabic Qur’an. How does the theory account for the Jewish elements in Muslim scripture, and how did the early Islamic exegetes manage to achieve so thoroughly a misunderstanding -? [something which Luxenberg claims on the p. 83 of his book] — of their holy book? Indeed, how did they come to have such a holy book — [meaning a book with such alleged “mixed-language”] — at all? One will readily concede that the text of the Qur’an is fraught with problems. It is difficult, however, to believe that many (or indeed any) of them have been solved by Mr Luxenberg’s book.” (p. 380).